Yes, this is another quinoa bowl, but it’s so good for you I can’t help it! 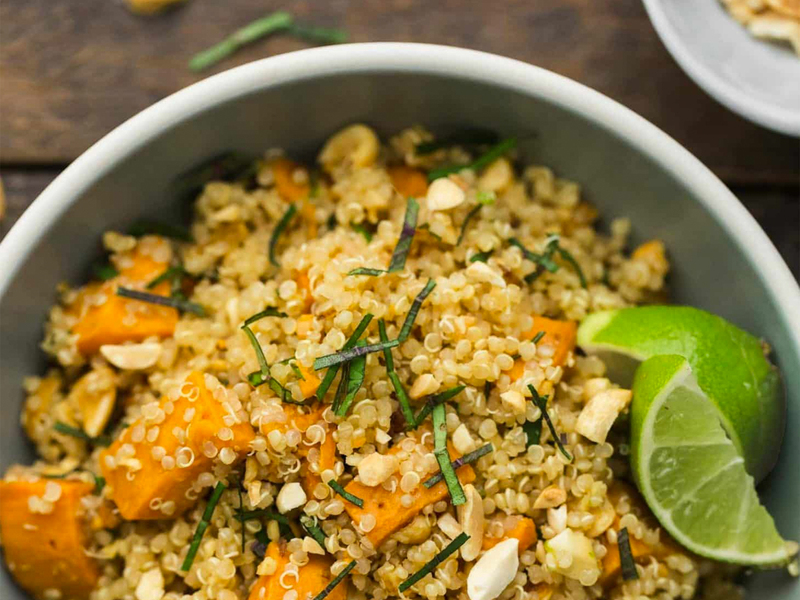 This sweet potato quinoa bowl is a super quick and easy dish that the whole family will love! As you can see I like bowls accompanied with sweet potato. This dish has a sweet & spicy kick. The flavours really compliment each other. Cilantro is a love hate kinda herb. My husband hates cilantro, can’t even stand the smell of it. So I leave it out in his dish. The dressing is still good without it (to be honest I put in a few leaves and he didn’t even notice). Dice sweet potato and spread it out on greased baking sheet (I use olive oil). Drizzle with olive oil, salt, cinnamon and chili powder. Do not over spice, as the sweet potato itself has a naturally sweet flavour. Roast it for about 15 minutes, or until fork gently goes though. Cook quinoa as directed. Once finished, season with all the spices. Set aside. In a blender, blend all cilantro dressing ingredients. You’ll want a smooth consistency. Viola! You are done! Easy, nutritious and delicious!